Halloween has always been a challenge for me……not only what costume to wear or make but how to keep the fun in Halloween and control the amount of sugar in my house. When my daughter was little I made special Halloween candy and had fruit available but admittedly, the fruit was plain and no fun at all. Check out these easy to re-create ideas from the Eat Smart blog. Vegetable skeleton….good for adults, too! A spooky take on the vegetable platter. I love this guy! Great idea for the kids and grown-ups. Serve with salad dressing for dipping. Great for a Halloween party table. Clementines are yummy and sweet. Great for the kids. There’s lots more to make and a thousand ways (or so it seems) to add sugar to the diet…..just the same, I don’t need to eat more sugar and having little ones jacked up on sugar isn’t my idea of a great time. Offering something healthy and yummy is a way to make a change. 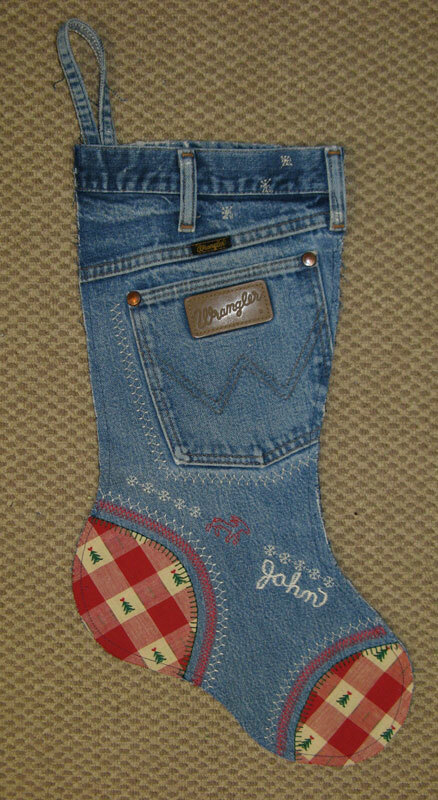 Post by Eileen of GoofingOff Sewing….who cooks, too. The kitchen is just another place to Goof Off. Create Magic With Every Stitch! Last Thanksgiving my granddaughter was in charge of making apple pie for the family feast. She loves to bake and has several recipes….at home. Unfortunately she left the recipe for crust back home along with her other recipes. I have the recipe, and several cookbooks at my home but we were at my daughter’s place….and she doesn’t love to cook so no cookbooks for pie crust. After searching she found one that was soupy (what was that about?) but we were able to save it with a bit of flour…OK, a lot of flour. Yay, Grandma saved the pie… Super Grandma…I need a cape. 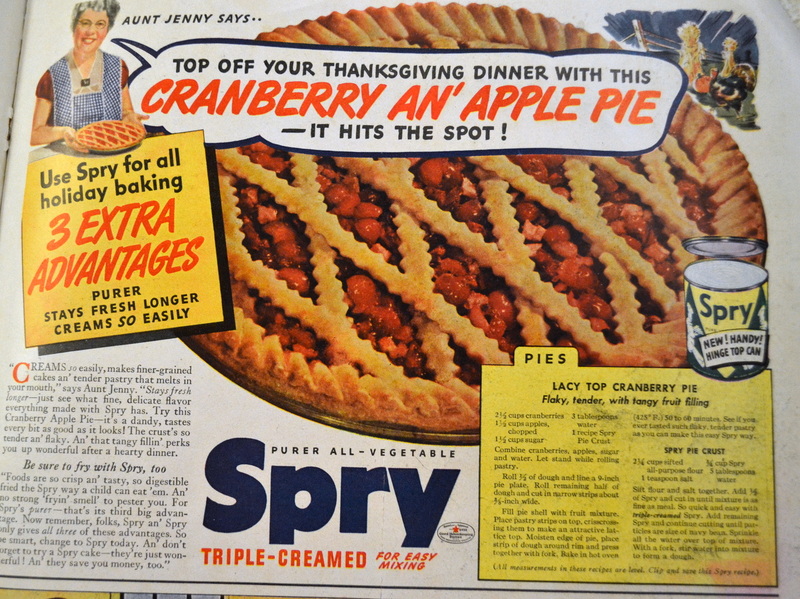 Anyway, this recipe is really a cranberry-apple pie with lattice topping. 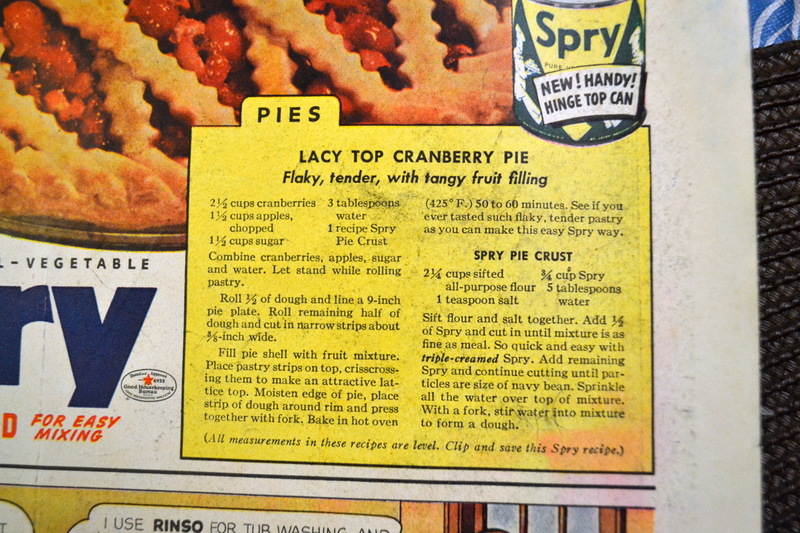 The recipe was featured in a Spry Shortening ad from 1939. The filling looks good and the crust recipe is traditional. Just a little insurance for this year’s pie. Post by Eileen of GoofingOff Sewing Supplies.